Originally Francois Valle came here from Quebec, Canada to Kaskaskia, Illinois to buy lead from the Native Americans. After arriving in 1748 and marrying the mayor's daughter, he set up a trading post here at Valles Mines, 'just' across the Mississippi. With breathtaking mineralization and 99% pure ore lead ore whose only impurity was silver, he stayed to mine and thereafter this place has been called Valles Mines. Commuting to Ste Genevieve over the French Village Road, he eventually moved there and ultimately became commandant of the fort there, sending his two sons to defend St. Louis. 269 years later, the Valle Mining Company* labors on, mapping digs, trails, forest stands, and historic ruins. We preserve original remnants, artifacts and history in the Lost History Museum. Reclamation around former mine sites has made land once bare as a cue ball now a regenerated oak-hickory forest. And in selected areas we are now in the 16th year of reestablishing 3 species of pine. Maintaining the same density as Alaska (we have one house per 3500 acres) has beautified the 8 square miles of lands, making it a jewel for the outdoor explorer. While the mining stopped 8 decades ago, it left behind two 10-acre lakes and miles and miles of streams, roads, wagon trails and paths through a huge forest. Our daily onsite security patrols report remarkable wildlife sightings while battling the occasional trash dumper. Please help us by writing down license numbers of any suspicious vehicles you might see. Francois Valle's original hand-dug mines, the Rocky Digs, sit in the 240 acre 'Wildlife Preserve Area #1' facing the Lost History Museum. Thanks to Wildlife Rehabilitation Clinic (636-677-3670, Fenton, MO or www.WildlifeRehabClinic.com ) for allowing us to be a Release Site for rehabilitated wildlife. 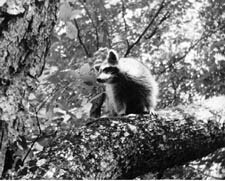 We have been able to restore overhunted native populations of red foxes, raccoons, ground hogs and possums. This spring around the lakes in Preserve Area #2, we spotted a flock of 55 turkeys. Canada geese on the lakes and blue heron in the creeks have become regulars again. Preserve #1 stays open all year. The other 29 acreages from 14 to 330 acres close during deer season (Oct. 1-Dec 31). Areas may be leased annually for private conservation getaways or seasonally as hunting areas during the turkey and deer seasons. We do not offer small game hunting or trapping or give preference to hunters or nonhunters. Call for info. "If you pack it in, pack it out with you". Thanks. * Valle Mining Company, a Missouri corporation. With former mills and works in Valles Mines, Missouri, the property now serves as a tree farm. Our office is located at 14116 Valles Mines School Road, 63087. To contact our Superintendent call 573-631-6875 (cell).